I don't quite remember how I ended up on one of Josie's sites johnandjosie.com, but one look at her Garden Path Wrap Vase I knew I had to get her on the site immediately and ask her a zillion questions. Josie, thank you so much for agreeing to do this interview (in the middle of your summer vacation!) and for not only sharing your own story but for also providing a ton of useful information and personal advice. I take pleasure in making utilitarian pots that are designed for everyday use but are quirky and unique in their look. 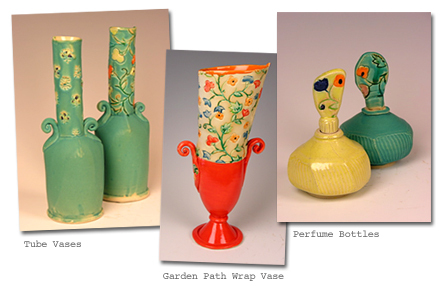 I combine my background in textiles with my love of clay. I stitch, dart and pattern my pieces. Everything I do is wonky. Even when I throw perfectly round pieces I bonk them around to make them asymmetrical. 2. How do you come up with your LOVELY LOVELY designs? Sometimes I get inspired when I see things that aren't related to clay at all - the strange way a poppy pod droops to one side or the ribbon rose trim we used to put on garments at Sweet Potatoes. I really like classical forms - they make a platform to play with when I'm distorting things and they provide a silhouette that is instantly recognizable even when it's twisted. I had the opportunity to take a private tour with a docent of the Sevres Ceramics Museum in Paris last fall. Boy... that provided a life time of inspiration. I think finding your signature style comes with just diving in and working. The medium has a way of dictating how things go. The more you work the more the work becomes yours. I am not formally trained in clay. I actually have a degree from CCA(C) in textiles. I have taken many workshops from clay artists who's work I have admired... Julia Galloway, Nick Joerling, Sam Chung, Josh de Weese to name a few. When I take these workshops I follow the demos but alter their techniques to fit my style. The openness and willingness to share in the pottery business is amazing and a wonderful way to gather up the knowledge I've needed to shape my own style. I am constantly learning new things and refining the way I see and do things. 4. There are tons of people out there who are currently doing something that they're not 100% happy doing. Do you remember the exact moment when you made the final decision to leave Sweet Potatoes and immerse yourself in pottery? Can you walk us through your own thought process and the steps that you took before you were able to make the jump? Did you just wake up one day and say "You know what? I'm done with fabrics and designing children's clothing and I'm going to start potting!" or was it a more deliberate process? I told Anna and Ginny 21 years before that when I hit 55 I was going to retire. I gave my business partners the longest notice (that I was going to retire) I think in the history of business. I started Sweet Potatoes right after the birth of my first daughter with Anna Hobbet (who was/is really the business visionary of the operation) - she too had just had her first child. In the beginning we did everything from cutting, sourcing, sewing, credit checking, shipping and of course my favorite job - designing. Our business grew steadily and quickly we were working 80 hour weeks - it was exhilarating, so much fun, crazily creative and exhausting - especially given we were balancing raising our young families at the same time. I loved every minute of it. Eventually we were able to hire lots of people to help us, including our third business partner Ginny Holmes (who handled sales and operations), but we were still working unbelievable hours. As we grew the demands just got that much greater. I knew about 5 years into Sweet Potatoes that someday I would want to do something else not quite as demanding. I told Anna and Ginny 21 years before that when I hit 55 I was going to retire. This seemed like a joke when we were in our 30's but as the time grew near it grew pretty difficult. We had grown an extremely successful business together and my leaving was going to mean a huge change. I hired a designer to take my place and Anna and Ginny took over as overall design directors. I must say that when the day finally came I had such a sense of pride in what we had accomplished, sadness in that I would miss the incredible crew of hard working talented fellow "Potatoes" and relief that I would now only be responsible for me...yikes how selfish does that sound? I am happy to say that Sweet Potatoes is going strong without me. I still do a couple freelance groups for them every season. This is fun for me, without the stress, and keeps me connected to something of which I am immensely proud. 5. On your blog, you wrote: "I am the WORST sales person. I get awkward and gawky. I don't know the words to make the sale happen." You, like most people enjoy the process of making and crafting and didn't get into it for the sake of "business". But eventually you found yourself having to make the transition from crafter to a businessman. What have you learned so far and what advice can you give others in the same situation? ...figure out where you want to sell and approach those people - they won't bite - have courage. I have learned that to make a living doing art is very, very difficult and that I truly admire those who do. For me the transition was from successful business woman to "not for profit" artist was an interesting one and probably the reverse of how most people do it. Working at Sweet Potatoes I was so steeped in costing, product development, sales figures, impossible deadlines, editing, profit margins, employee relations - the business of business. The way I'm doing pottery - there is none of this and there is also no such thing as a profit. I am happy when I can pay my rent and buy materials. I am really, really lucky that I don't have to support myself with my art. 1. First and foremost be passionate about what you're doing. If you are successful you will be involved with your product 24/7 so you had better LOVE it! 2. Then know your market - figure out where you want to sell and approach those people - they won't bite - have courage. Usually they will be interested in seeing new work, if it's good and fits their direction. Even though they may not buy they can sometimes give you just the feedback you need to guide you in the right direction or send you to someone who will buy. 3. Really important - don't be afraid to ask a million questions and be fearless! 4. In my case the fact that I had two partners who were much better at handling aspects of the business that I wasn't so good at (sales, operations and business vision) made for a wonderful combination. Be careful If you are seeking partners. Be sure that your skills compliment each others and that hopefully your partner can bring something to the table you're not so good at. Partnership really is like a marriage and can be pretty sticky and costly if you end up with the wrong person. 6. Do you have a technique that you've developed or discovered that has made your life easier? 1. You make the block by pouring mixed up Plaster of Paris into a baking dish that has been sprayed with mold release. 2. Let it dry, sketch what you want as your image on to a small section of the block then just carve your pattern into the soft material (an image not bigger than 1" square is best). Make sure you carve deep enough and wide enough so that your pattern will make a strong impression. You can carve many, many images on one block...I'm still using the one we did in class. She used a lot of geometric, almost quilt like, images that can match up and form an all over pattern. 3. You then take a lump of clay big enough to cover the image on one end and enough so that you can grip it with your fingers on the other. Squish the clay lump into your carved image, make several of these from you original carving then let them dry and bisque fire them. You now have your very own original stamp to decorate your pottery with. I have done, among other things, a series of poppy motifs that I use often to stamp bowls cups and vases. You can buy commercial stamps but doing your own makes your work so much more unique. My very favorite place to look at other people's work right now is an online store/gallery called AKAR. I would LOVE to be in there. In Berkeley we have a beautiful store right down the street from my studio called the Gardener. They merchandise everything they have so perfectly. I would be honored to be in there. My studio mates and I have created a small gallery that's in front of our studio - fourth & clay. This is my favorite place to show my work as I have control over how it's displayed and I get feed back from our customers. 8. How has your experience been at the ACGA show? Would you recommend participating in these types of events? The annual ACGA Show is such a great venue. It's a lot of work especially setting up and taking down but I think it is so worth it. ACGA is held outside in a great big park in a wonderful area where people come to actually buy your best work. 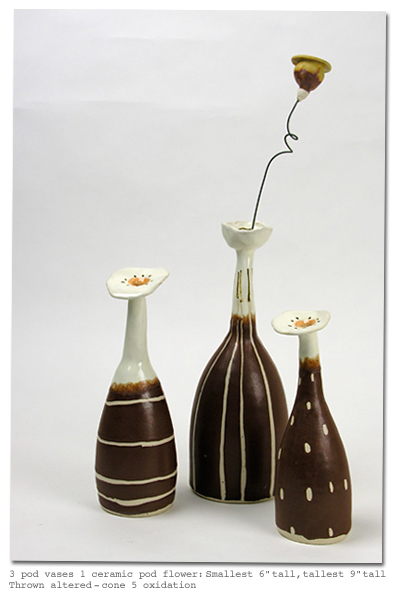 It is a juried group that represents the best California artists in clay and glass. The jury process is tough. I was a nervous wreck before my jury and was thrilled when I was accepted ...some times out of 20 applicants they select only one or two people. I sold my most expensive piece ever this last show and it made me feel so good as I felt that the buyer really loved the work. You get to talk to all your buyers and get the most incredible feed back. It's definitely worth doing these kind of events. 9. What part of the pottery process is your favorite? I always hold my breath when I open the glaze fire kiln. I love the "making" process the best. Starting with a lump of clay and making it transform is such a thrill. Learning the techniques to make it happen is still a challenge. Usually I make a ton of work, bisque fire and then glaze and final fire. I put off glazing... it's risky and seems to be the place where I mess things up the most. It's also the end of a very long process. Sometimes my vision and what comes out of the kiln aren't at all the same. This can be either a wonderful surprise or a sad disappointment. I always hold my breath when I open the glaze fire kiln. 10. Who is your idol/current craft-crush? My biggest all-time idol is Betty Woodman. I got to see her work at the Metropolitan Museum a few years ago. She was actually there and I gushed at her how much I loved her stuff....I'm sure I made quite an impression...oh well. My real life "clay crushes" are are two my studio mates - Rae Dunn and Christa Assad. They're just the best. Thanks so much for introducing Josie's work on your site. It is truly beautiful! I also like her name, that's my daughter's name too. The interview is excellent! Great interview with Josie! 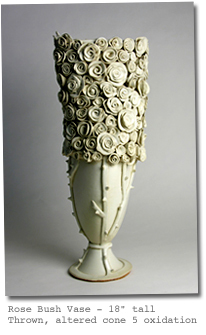 She is very much as she describes her pottery mentors with the "openness and willingness to share..." I read her blog and always learn something! I love Betty Woodman, too!